Apparently the number of years I've been using this Twitter thingy has reached double digits as of today. Thank you all for reading my drivel and clicking the links and talking to me and stuff. Celebratory dram tonight. A lot has happened in those 10 years. According to Twitter I’ve posted 33,838 tweets so far (probably a few more by the time you read this). Apparently I have just under 3,000 people following me now (I hope not too many of them are bots). Quite a few of you I’ve met personally, others I only know from Twitter (and sometimes other social networks), but we’ve still had many helpful, interesting, funny and more exchanges. Others I don’t really know yet, but I hope we’ll bump into each other one day. I’ve learned quite a few things on Twitter, found out information, had a lot of fun and more. I hope I could give some of that back, give those who follow me or communicate with me something to enjoy, something they found helpful or something that inspired them. Or just something to laugh. With that I’ll finish for now, time for another dram. And another tweet. The Scotch Cinema has been around for quite some time and is still going strong. Recently the had not just one, but THREE Laphroaig Sightings in One Movie. Some older Laphroaig sightings are also mentioned in their related links. From a German music blog we learn that Amy Macdonald isn’t a whisky drinker but her father is partial to a wee dram and in particular a Bruichladdich from Islay. Malted (a whisky blog in its day job) has a very interesting post with old Islay pictures in Islay Photographs 1902-1960. On the same blog we also find Islay and RAF Port Ellen. Heiko from Switzerland documents his visit to Laphroaig with lots of pictures. Sometimes I find Islay references in rather unexpected places like a post Sleep inducing molecules: Propofol, for January 2017 on the Liverpool Life Sciences UTC Innovation Labs. I didn’t fully understand it, but there’s some kind of link between Propofol and the Phenols Islay whiskies are famous for. I’m not sure if it’s the type of book I’d read, but may be some of my German readers are interested in reading Die verhexten Zombiekarnickel and report back what they think? Apparently zombies, witches and distilleries are involved. For daily updates about the bird sightings on Islay you of course still have to go to the Islay Birds blog. Posts that caught my even recently were a Whitefront with a neck ring, the New Year’s day post with the annual rainfall figures and a flock of Twites. In addition to that the RSPB Blog also has a great entry about Twite on The Oa. I’ve stopped the Friday Islay picture, but how about you instead take a look at the Friday fold: Smaull Graywacke at Saligo Bay, Islay? Or the Friday fold: Machir Bay I and Friday fold: Machir Bay II? The iLaddie Whisky Nerd from the Netherlands visited Islay late last year (I helped him a bit during his preparations), he has a whole Islay Trip category on his blog. Marc Calhoun takes us to Cashels of the Hebrides, which includes one on Nave Island just off Ardnave on Islay. Alaina and Philip visited Islay mainly for the whisky distilleries, you can read about their visit in ISLAY, SCOTLAND: A TRAVELOGUE. Henryk visited Islay as part of a Scotland trip, you can find some great pictures in Urlaub 2016 Schottlands Nordwesten – Teil 3: Isle of Mull, Islay Scotland und Jura, Urlaub 2016 Schottlands Nordwesten – Teil 3.5: Kilchoman Distillery and Session @ Port Charlotte Hotel Islay. I think I’ll leave it at that, the Islay Blogging Roundup NC #1 is done. The next one will appear as and when I’ve come across enough good blog entries worth mentioning. If you have one (or know of one) you think I should mention by all means send me the link. Well then, there we are, here is my Christmas present for you, a new.islayblog.com for your perusal. After 10 years of blogging ‘manually’ on www.islayblog.com I’ve decided to move on to a new blog with a real CMS. With my recovery from my heart surgery progressing well I thought it was finally time for something new here as well. The header remains the same (well, OK, I had to tweak it slightly to fit in here), it’s still the familiar view of the Loch Indaal lighthouse with the Paps of Jura in the distance, one of my favourite views on Islay. The content of the blog will largely remain the same as well, as will the categories. I’m going to retire at least one of them though, with the Islay Pictures Photoblog going strong I’ve decided to retire the Friday Islay Picture. 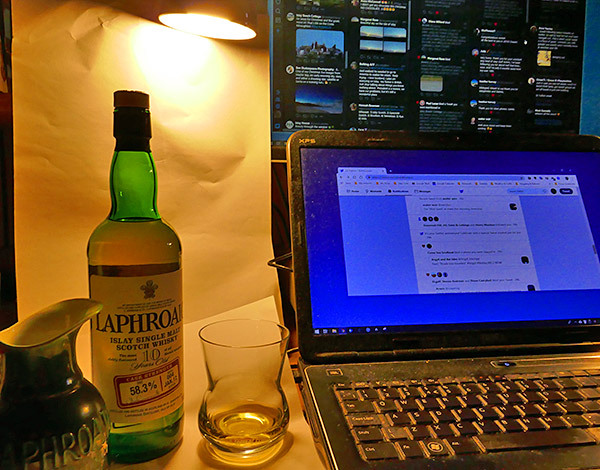 I’m undecided on the Islay blogging roundup, time permitting I might revive that one. In a way I’m still fond of the idea. Apart from that I’m going to blog about essentially the same as before, anything Islay (or Jura, Colonsay, Gigha and may be even Kintyre) related I come across. Videos, pictures, news, stories, fun things, events, businesses, short snippets, longer texts, links, updates and whatever else crosses my path. I hope you will join me here on the new blog if you were a reader of the old blog and I hope to may be gain a few new readers as well. I’m keen to make it a dialog as well, the comments are open for everyone, so don’t be shy and make your voice heard (within reason of course, you’ll be in my house after all).